Land clearing is known to increase runoff, and in many dryland landscapes is also associated with rising saline watertables, causing increased stream salinity and degrading riparian vegetation. The limited understanding of how river morphology responds to these changes and the potential for vegetation-based strategies to offer river management options under these conditions, has prompted this research. 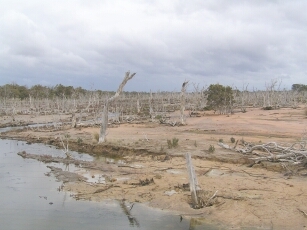 In southwestern Australia the severity of salinity and recent nature of land clearing provides an appropriate setting to investigate river response. A data-based, multidisciplinary methodology was applied to determine how land clearing and landscape salinisation has altered landscape sensitivity through changes in erosive potential, system connectivity and material threshold mechanisms, and how these affect patterns of river response. 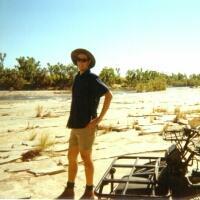 Everyone knows what a huge issue salinity is in Western Australia. Increased salt kills vegetation in and around the river channel. Vegetation plays a very important role, preventing sediment transport, bank erosion and slowing flow velocity. Salinity increases the velocity and volume of streamflow, kills vegetation, and increases erosion. Some reaches have proven to be resistant, whereas others have undergone dramatic changes in the last few decades. There has been very little research into the effects that salinity has on actual rivers, and if steps to manage individual river reaches appropriately is not taken soon, they may be irreversibly changed.